Does anyone recognize this block?? Thread: Does anyone recognize this block?? I love this pattern, but I have no idea what it's called and I really need to find a tutorial or at least instructions. I've been playing around with scraps this weekend and I'm not quite getting it. I'm guessing it's foundation pieced, which I've never done before. I gave it a whirl, but it was a disaster. My strips stretched and twisted something awful, I don't know if it was the fabric or me. But I have the perfect fabric for this pattern. Can anyone help?? and handle the strips as gently as possible...specially when pressing. I would use a dry iron. It does look like it is foundation pieced with the white being the foundation. Then the blue, the multicolor and the red are sewn at the same angle in each block. It would then be trimmed to whatever size you want the blocks to be and 4 blocks sewn together to make each large square. I like that design. I would sew 5 strips together, (print in middle, blue/red to either side, then white strips) then cut squares. You would have to mark your square ruler so that you cut the white off-center to make the star shape for each corner (like the twister ruler does for their pattern). I think it could be done just by sewing strips together, with white being the strip at the top and bottom. Then take your square ruler and set it at an angle to cut the squares. If you have a protractor, the angle should be easy to find. I downloaded a protractor template from Google and use it all the time to figure out pattern templates. has a white strip on each side of the block. Maybe you can get some tips there. ​That does look very similar EasyPeezy and simple to add another triangle to the top of the block too. I think I would sew the white strips on to the block, flip out the fabric and then trim back to the square. I would then remove the extra backing fabric under the triangles. It's a variation if the strip tube. My suggestion? Draw a block on paper and try your own PP block. Thanks so much soccertxi! The Dervish block is helpful. It looks great to me. What a way to use up scraps. I agree with YNGLDY - use the Twister Ruler method..... sew strips straight....cut block off kilter. Last edited by quiltinghere; 05-21-2013 at 04:21 AM. Yepper.. that's a twister block.. They are fun to make and are not hard... I've made them in several sizes.. Take a look at the ruler, you could most likely make one to try the block. It's a very simple but very clever idea. http://signatures.mylivesignature.co...AC3300A534.png Life is good when you're busy with babies. That's not the block I'm looking for, but I like it!! Thanks! I'll look into the Twister Ruler method. I have made this and it is not foundation pieced. You just need to be very precise with your quarter inch seams on your strips. If you are out slightly, it will not work as each slight mistake multiplies as you go along. 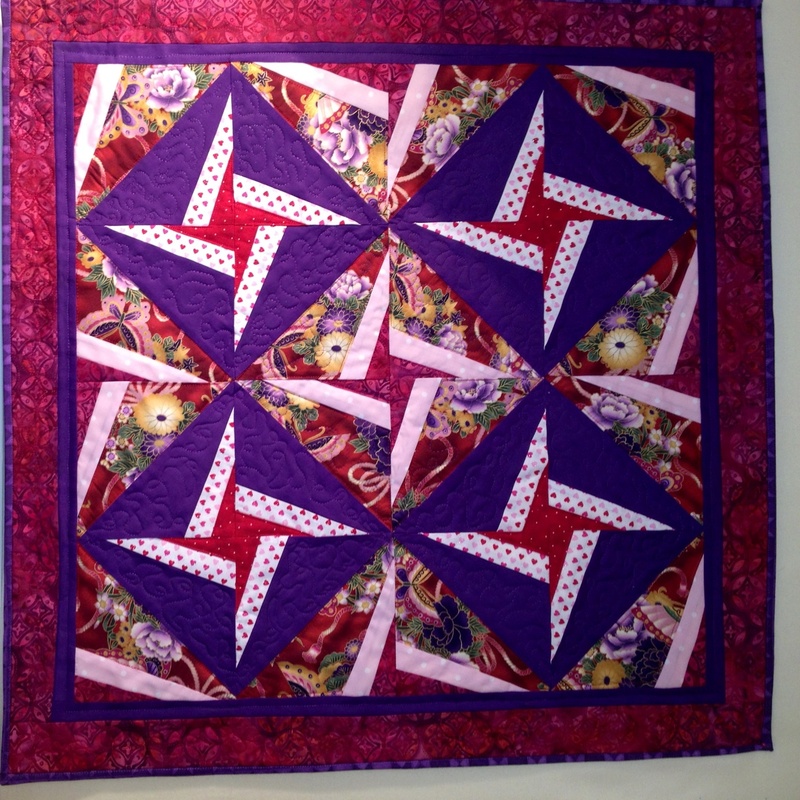 The pattern was in a magazine which was devoted to scrappy star quilts. I can't find it at the moment but will pm you with the name as I do. A number 8 people in our group made the quilt and only 2 people were successful with it, so it is deceptive. Try rearranging those blocks and see what you can come up with. Using a protractor, find the angle of the pieces in relationship to the sides of the blocks. Then cut the strips on that angle. Sew all strips together and then use your square ruler with the angle marked (use a piece of 1/4" tape if it's not an angle already marked on the ruler) and cut out the size squares you want. Bingo---the edges of the block should now be on straight of grain. I know I've seen it before, but can't remember where. 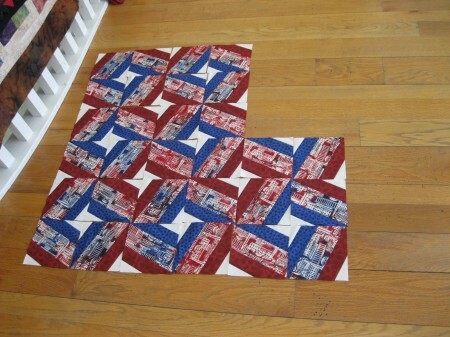 However, I would check with quilterscache.com as they may have the block pattern as well as directions/suggestions. Hope this helps. You could do it with strips ...looks like 5 strips -a white strip, a blue strip, then a middle print strip, then a red strip and then another white strip. to come out 12 1/2 inch.block.. make white, blue, and red strips 2 1/2" wide and the middle print strip 4 1/2" wide. I will make up a sample block and see if this works and try to post it! You could draw up paper templete for pp piecing or use the freezer paper method. in the size block you want.. Here is the website of Patricia Pepe who developed the X block ruler and has many patterns using this square ruler. I have made a number of x block quilts, and it's lots of fun, lots of varieties. I made this in my strip paper piecing class with Peggy Martin. She called it Pinwheel Polka looks like what you are making. I found that pattern in one of my "easy" books - at least it looks very similar - its from the Book "Two From One Jelly Roll Quilts" by Pam and Nicky Lintott - the pattern is called "Spinning Tops Quilt" - it uses jelly roll strips. Sew four 2 1/2" strips together then line up the rule on the 60 degree line and cut 6" squares - then you have to twist them again and cut another small piece off - anyway the pattern is in the book. Good luck. I agree with ArtsyOne. This looks extremely simple when you study it. It will result in some waste of the white fabric, but probably you can find another use for the scraps. The type of star you wind up with is similar to a Friendship Star, I think. I like this one, too. Have not seen it before, and it's going on my bucket list. It would be great way to feature a print you like a lot. Edited to say that I just noticed yngldy also described the process correctly. This one would definitely be easier to do just sewn as long strips that are then sub cut rather than using foundation piecing, imo. Last edited by Rose_P; 05-21-2013 at 08:12 PM.